Devaney considers how computational and psychological techniques can be combined with musicological knowledge in order to expand our understanding of vocal performance. Her talk will include a discussion of the open-source AMPACT toolkit she developed to extract performance data from recordings and the results of experiments to quantify vocal intonation practices and singer identification. The broader implications of her work for composition will also be considered. 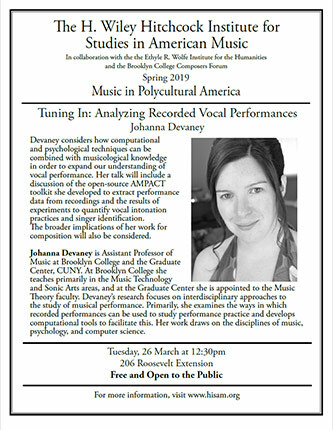 Johanna Devaney is Assistant Professor of Music at Brooklyn College and the Graduate Center, CUNY. At Brooklyn College she teaches primarily in the Music Technology and Sonic Arts areas, and at the Graduate Center she is appointed to the Music Theory faculty. Devaney’s research focuses on interdisciplinary approaches to the study of musical performance. Primarily, she examines the ways in which recorded performances can be used to study performance practice and develops computational tools to facilitate this. Her work draws on the disciplines of music, psychology, and computer science. 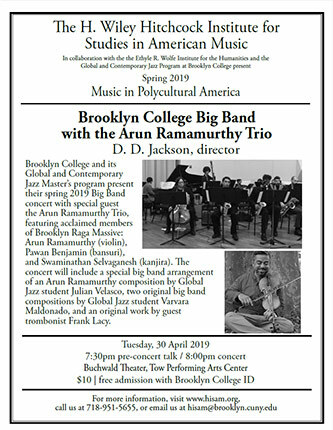 Brooklyn College and its Global and Contemporary Jazz Master’s program present their spring 2019 Big Band concert with special guest the Arun Ramamurthy Trio, featuring acclaimed members of Brooklyn Raga Massive: Arun Ramamurthy (violin), Pawan Benjamin (bansuri), and Swaminathan Selvaganesh (kanjira). The concert will include a special big band arrangement of an Arun Ramamurthy composition by Global Jazz student Julian Velasco, two original big band compositions by Global Jazz student Varvara Maldonado, and an original work by guest trombonist Frank Lacy. Modernist composer Miriam Gideon’s opera Fortunato (1958)—a tragicomic meditation on the themes of honesty and sacrifice—remained unorchestrated at the time of her death in 1996. Her handwritten manuscript consists of a piano score for all three scenes, plus a sample orchestration of only the first scene. Composer and conductor Whitney George is currently working on an arrangement of the entire opera for chamber ensemble, which will be performed as a staged work in May. 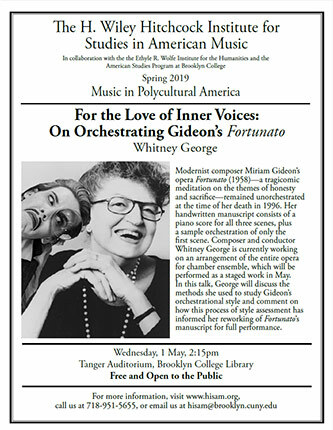 In this talk, George will discuss the methods she used to study Gideon’s orchestrational style and comment on how this process of style assessment has informed her reworking of Fortunato’s manuscript for full performance. The Sonic Arts Student Union will host dynamic trumpeter Nate Wooley, who will perform Éliane Radigue’s Occam X. The concert will also feature Becoming Air, Wooley’s compositional collaboration with Annea Lockwood. The night promises to be a beautiful evening of contemplative sounds by two monumental yet overlooked composers of minimal electro-acoustic music.